In times when political correctness is devastating the minds of mankind, to have a personal way to see the world is a sin. A sin will make you become an outcast of society, because you don’t fit in the expectations of people and on their morality. To speak in straight and honest words: political correctness is just a changing in the status quo, but there’ll be always a kind of censorship, and the outcasts will appear. Metal fans will be outcasts in both ways. Because many of us really use our brains, we do not accept rules. 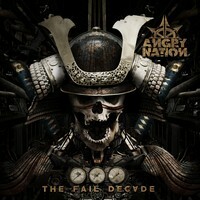 And as freethinkers, a very good name for outcast like us is from the Austrian band ANGRY NATION, a trio that comes tearing everything down with the massive music and intelligent lyrics on “The Fail Decade”, the band’s first album. Musically, their style is nothing new: it’s that old and very good form of Thrash/Death Metal with clear influences from SLAYER and names from the SIODM (Second Invasion of Death Metal) from the beginning of the 90s. The main difference is that these guys are not doing something moldy and missing the past. No, their music sounds violent and fresh, because they really have personality. The sound quality of “The Fail Decade” is really amazing. Every band needs to balance their musical aggressiveness with a good level of sound clarity, and these guys made an astonishing work, because the album sounds aggressive, but of course you can understand what they are playing, and the instrumental tunes are really great. And the artwork of the album expresses the fusion of the old ways on Thrash/Death Metal with modern influences. It’s fine work from Kewin Miceli. The energy of their songs is amazing, and their aggressive and worked insight is really lovely. But take some time and see their lyrics as well, because they are intelligent and productive, in a way that makes you think about the world as it is in reality, not as a picture done by nasty liars. Their songs are all excellent. But I suggest you to take a hearing on the brutal apocalypse of very good riffs called “The Decent of Men”, the great rhythmic changes shown on “Society Extinct” (bass guitar and drums works are really very technical and heavy), the bitter vocals on the massive energy of “The Fail Decade” (very good contrast of guttural tunes with shrieked screams), the brutal instrumental parts (specially the guitars) on “Weapons of Mass Migration”, the bitter slow and technical parts of “Nemesis Illuminatia” (even some parts from pianos are presented, along with excellent drumming), and the excellent aggressive and melodic lines of the guitars on “In the Name of the Race”. But their version for THE WINGS’ “Live and Let Die” is really very good, and for those who don’t know, THE WINGS was the band that Paul McCartney founded after he released his first solo album a little ago THE BEATLES dismissed. They are good, and sharpening their musical talent will make ANGRY NATION a great name in a near future.